The Savills Property Price Index (SPPI) is a market snapshot highlighting performance and trends for those monitoring the real estate market. The Savills Property Price Index (SPPI) is a market snapshot highlighting performance and trends in an easy to read and information-rich format. According to Savills in Q2/2018, The Residential Index for Hanoi increased by less than 1 point (pt) quarter-on-quarter (QoQ) and decreased 1 pt year-on-year (YoY) to 104.81. The average selling price was US$1,196/m2, up 1% QoQ. The average absorption rate was reported to be 27% with sales reaching approximately 7,500 units, up 31% QoQ and 11% YoY. Grade B dominated with a 59% share or 27% absorption, whilst Grade C performed well with 38% of sales. Savills report that "Grade A transactions decreased due to limited available stock and high asking prices" and suggest that in 2H/2018, 20 projects will supply over 14,300 units, mainly in Grades B and C." Long Bien District with a 19% share is slated to be the largest supplier. With a 36% share, The West is expected to continue as a residential hot spot. 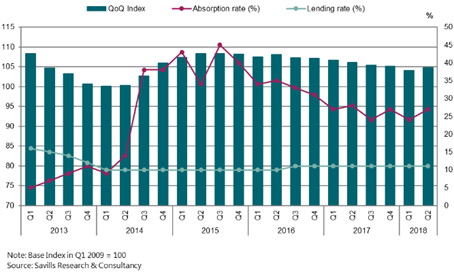 In Q2/2018, The Office Index was 68.4, up 1.2 pts QoQ and 3.2 pts YoY, due to rent increases of 2.4% QoQ and 4.3% YoY. Savills say "The CBD index was up 0.4 pts QoQ and 3.2 pts YoY as occupancy slightly decreased by -0.4 ppts QoQ. With the improved rent of projects in the non-CBD, the area index increased 1.6 pts QoQ and 4.9 pts YoY despite a decline of -0.7 ppts YoY in occupancy." "As current supply is limited, short-term rent in the CBD is expected to rise; two projects are expected to come online in 2019. 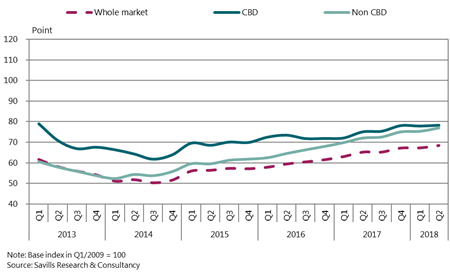 A surge of new supply in the non-CBD area provides occupiers with more choice whilst maintaining fierce competition" reported Savills.